Orbits and fly bys of asteroids are some of the exciting missions we have planned for CAT enabled CubeSats. It would not be cost effective for large, expensive spacecraft to go to 24 Themis, so most of them go to high profile locations: typically Mars and the moon. With the low cost to make and launch a CubeSat, a huge variety of destinations will be viable, including 24 Themis! These sorts of mission will give us a more comprehensive picture of our solar system as a whole, not just the flashy destinations. The aimed reduction in cost for a mission using a CubeSat vs. a traditional mission is 1000, so a mission with a scope similar to Deep Space One for example (a technology demonstration mission that also flew by an asteroid) would cost around $150,000 instead of $150 million, albeit with a smaller range of instruments. One other mission I've always wanted to see is one to a small trinary asteroid system, where three probes would each circle one of the three asteroids and gain a closeup understanding of the system as a whole, and such a mission is also easy to visualize with a price tag below a million dollars instead of a few hundred million. So naturally a campaign like this is an ideal one for me to support. 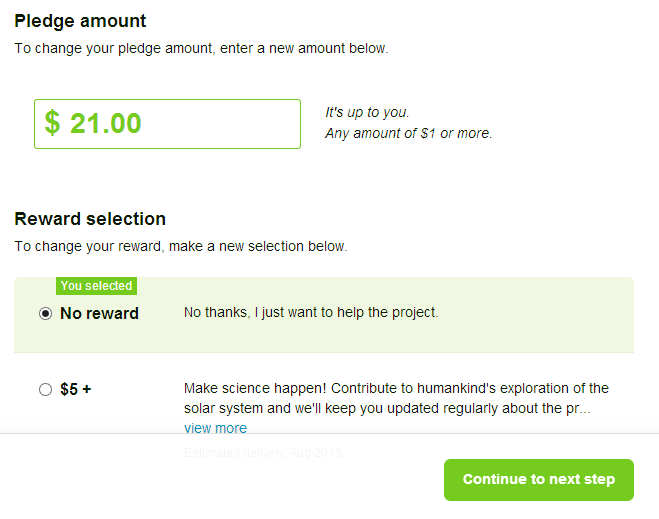 I'll probably up the pledge over time, especially if it looks like things are coming down to the wire. At the moment the campaign has been going for eight days, $25,151 has been raised, and there are 22 days left. At this rate the campaign will reach $100,000 by the end, which is only half of the desired amount. If $200,000 is not reached then the campaign will receive nothing, so they will need to drum up about three times the excitement in order to reach the number.